This should be a Pay Per View fight. But Wall Street would rather you never know about it! But we are going to do it anyway! The S&P 500, the big daddy of them all, the largest basket of 500 non Dow Jones Industrial Average stocks. Ladies and gentlemen, in the red corner, let me introduce you to the $SPY, the S&P 500 index ETF that trades 1/10 the size of the S&P 500 index. Ladies and gentlemen, in the blue corner, let me introduce you to the $VFINX, Vanguard’s low cost index fund. As the industry’s first index fund for individual investors, the 500 Index Fund is a low cost way to gain diversified exposure to the U.S. equity market. The fund invests in 500 of the largest U.S. companies, which span many different industries and account for about three-fourths of the U.S. stock market’s value. The key risk for the fund is the volatility that comes with its full exposure to the stock market. Because the 500 Index Fund is broadly diversified within the large-capitalization market, it may be considered a core equity holding in a portfolio. While that may be true as mutual funds and hedge funds do charge large fees, we will attempt in the rest of this article to see if we can “mathematically” prove if a low cost index fund is better than your everyday index ETF that anyone can buy. For starters, it appears that $VFINX’s index fund version (left) and the $SPY index fund (right) have the same allocation to the T.
I don’t know if one copied the other or they both copied each other. But they have an identical breakdown of percent allocation to different sectors. An expense ratio is the amount (percentage) of the total assets under management that are taken out each year to pay administrative fees (salary’s, back office, accounting, etc). The amount taken out each year to pay operational expenses for managing the fund. According to Vanguard, $VFINX as of 4/27/2016 has an expense ratio of 0.16%. 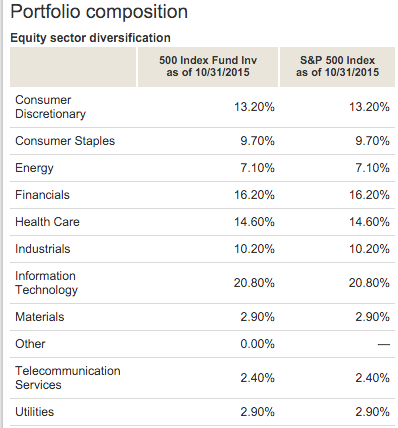 According to State Street Global Advisors, the $SPY index fund has an expense ratio of 0.11%. While it looks like a small margin of victory, round 2 is a victory for the $SPY index fund. Let’s just get to it shall we? Small win again for the $SPY index fund. How much money do I need to pay the toll? How much money do I need to play the game? How much money do I need to invest in one of these guys? Can I buy or sell whenever I want? If the market is tanking, can I buy? If the market is shooting higher, can I sell and book profits? For starters, we know with the $SPY index fund, you can get in and out whenever you want any time throughout the trading day. An investor can redeem fractions or whole shares of a mutual fund by selling them at the NAV. When will the redemption price be determined? At the same time that the fund company computes the daily NAV for the fund and determines at what price investors purchased shares after the close of trading yesterday or before the close of trading today, or 4pm. Fortunately for us, we don’t have to do any number crunching here as our friends from Vanguard are nice enough to give us the chart right on their website. Strangely however, they are displaying this information to the public that clearly shows $VFINX in the blue lagging the $SPY in the yellow. It appears that the $SPY index fund has returned more when compared to $VFINX. NOTE: $SPY’s inception date is 1/22/1993 so they do not have statistics going back to 1976. The goal the these “low cost index funds” is to gather assets and charge fees. I am saying that together we just proved that $SPY is cheaper and returns more money than $VFINX. I am saying that if you buy this “low cost index fund” then yes, it is impossible to beat the market. I am saying that “low cost index funds” are not the best options for individual investors who want a “diversified” return. It is mathematically impossible for you to make more money giving your money to Vanguard and having them invest in $VFINX for you when compared to opening up a brokerage account and buying $SPY yourself.